Application structure by using ASP.Net MVC, Web API, AngularJs is not complicated but we need to know what NuGet Packages are required and what can make the application easy and speed up the development. In this article we will use MVC 4, Visual Studio 2012, Web API and AngularJS to create a single page application. We will try to use different folders for keeping our controllers, services, directives and views and will see how easy it is to use and link them. In future when we will create any new controller, directive or service, we need to add them here. ng-app="app" The ngApp directive designates the root element of the application and is typically placed near the root element of the page - e.g. on the body or html tags. ngView is a directive that complements the $route service by including the rendered template of the current route into the main layout (index.html) file. Up to this point everything is smooth now we will add entity framework to access the database to pull the customer records from Northwind database. Add ADO.Net Entity Data Model and add all the tables from Northwind Database, we are not discussing about entity framework so we will not discuss more here about it. 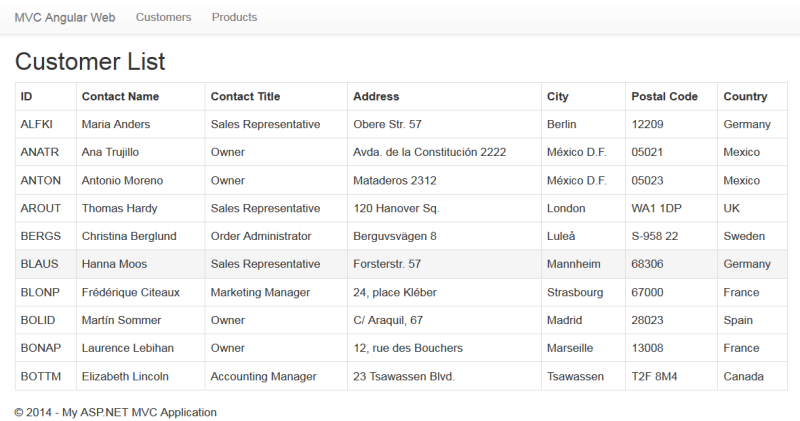 After adding Entity Data Model rebuild the application and add controller Customers into controller folder. 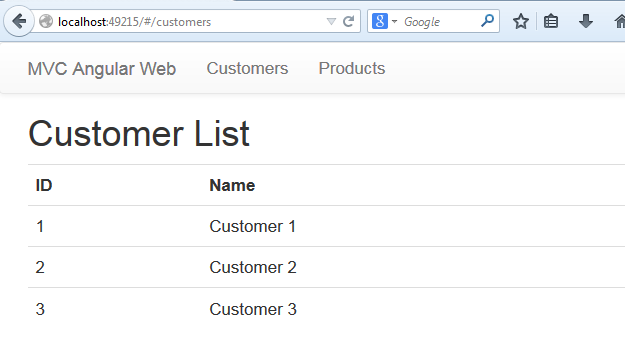 Change the GetCustomers code a little bit to get only 10 records for now, latter on we will change it to search the customers, when we will use ng-grid. To test, whatever the tool I know the best is google chrome “REST Console”, if you want you can try it. In this article we could not add much of the features because we were discussing the application structure, but in our next article, we will use ng-grid to show the result with paging, sorting and searching functionality.